Digbeth Dining Club is Back! Digbeth Dining Club relaunched Thurs 25th Jan with new Cafe! The Midlands’ premier street-food destination, Digbeth Dining Club, has returned to Digbeth. The multi-award winning street-food event based in Digbeth which brings together the nations best traders is now being extended to three days a week with expansion across the site. Lee Desanges, of Baked in Brick, who is the current British and European Street Food Champion is returning to where to it all began for him three years ago, and will have one-off specials and weekly changing menus to commemorate the first of a series of residencies at Digbeth Dining Club. There’s a brand new French 1920s themed bar: Cafe Colette. DDC begins with a full, month-long residency from one of the Midlands most popular street food traders: Baked in Brick. As well as Cafe Colette, Digbeth Dining Club will be operating across its the other venues: The New Orleans inspired Mama Roux’s and Brooklyn influenced Spotlight as well as a new look Unit 4, which is being converted into an immersive games room, where children (and adults) can enjoy themselves all evening. The whole complex will be fully covered meaning weather will never be an issue ever again. “We’ve got big and exciting plans for the year. Whilst we’re going three days a week now in Digbeth for the rest of the year, we’re also looking to be bringing a lot more of our events in and around the Midlands. We’ll be returning to Coventry, Solihull, Wolverhampton and Longbridge this Spring, which were all massively successful events, as well as new sites soon to be announced. We are also launching our lunch clubs across Birmingham and the Midlands throughout the week starting in Coventry in Febrary. 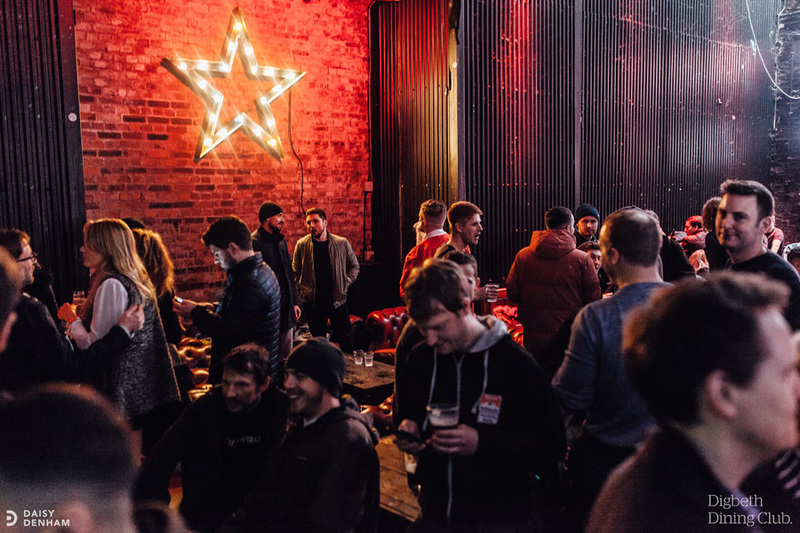 Our sell-out event, ​Sear & Smoke​ that we ran alongside Original Patty Men back in November will also be returning in the Summer at some point, we’re also planning loads more larger scale themed events in Digbeth throughout the year. After The Rainbow Venues had their license revoked at the end of last year, we’ve lost their financial support. With the added costs involved in this, there has been a greater financial strain put on us as a business, so we have been left with no choice but to charge a small entry fee on Fridays and Saturdays. People are still more than welcome to come down for free before 5.30pm, but after that, we will be charging just £1. For any more information, head to ​www.facebook.com/digbethdiningclub​.